Thank you for the updates and all you do!! Prayers and condolences to the family.. I'm not seeing how this can be good for us. They start with the lowest bill and work their way up, giving short windows for exchange, and once they have changed all the bills they want to use, they then start the monetary value change of the currency. I truly hope i'm wrong about this, but my pessimistic side is creeping in. We hope and wait for the best outcome for us all. Thoughts about this from someone much smarter than I would be appreciated. Excellent post UNEEK!! Thank you! Can member titles be updated or changed? I am not able to do it myself and with good reason I'm sure. Just curious on how these are governed and or updated. Any info on this would be appreciated...Thanks! 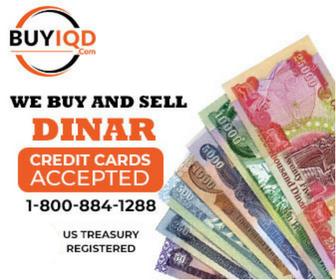 Central Bank Sells Gold To Raise The Value Of The Dinar ! SEE YA - AND RAISE YA ! Frank's Big Update - Tomorrow November 1st Will Launch A Rate Of 1:1 ! Thanks Thug!!! BTW, is that the opposite of the Red Hat society?!? BIG UPDATE - HUGE - MASSIVE ! Thanks for the chat Adam!! Couldn't agree more Patty... I love reading what the Gals posts... wouldn't be the same around here without them. I'm very happy they are here! BluWolf Is Howling Mad ! Thank you as always Thugster!! HE HAS AN IMPOSTER !